First Time in Phi Phi: Where Should I Stay? - Where Should I Book My Hotel in Phi Phi? First Time in Phi Phi: Where Should I Stay? Where Should I Book My Hotel in Phi Phi Island? Planning your first trip to Phi Phi Islands can be tough. Despite their small size and the fact that only one island of the group of six – Koh Phi Phi Don – offers accommodation choices, there is still a great variety of destinations in Phi Phi to suit different tastes. As said, all these destinations are on a single island, yet could not be more different: from the lively central village to the tranquil yet convenient Long Beach, to the remote and secluded resorts of Phi Phi Don’s southeastern coast to the luxurious and peaceful Laem Thong, there is a right place to stay for everyone. Check out our introduction and description of the four main areas of Phi Phi Islands below; it will surely help you to plan your first time here. Should I book my hotel in Phi Phi Central Area? The central area of Koh Phi Phi Don is located between Tonsai Bay (where the ferry pier is situated) to the south and Loh Dalum to the north. The area counts four sub-areas: Tonsai West, Tonsai Village, Loh Dalum, and Tonsai East. 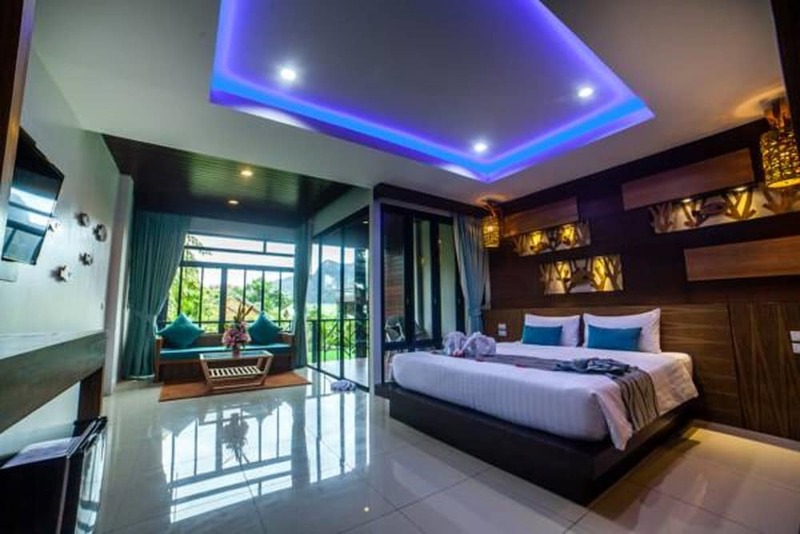 It is the liveliest place in the whole Phi Phi Islands and hosts a great choice of hotels, restaurants, boutiques, and bars for all type of customers and budgets. Tonsai West is the quietest side of the area, while Loh Dalum, Tonsai Village and, to a slightly lesser degree, Tonsai East are the buzziest parts of Phi Phi Don. You like Phi Phi Central Area? Now pick the right hotel! Should I book my hotel in Laem Thong? Laem Thong (Golden Bay) is a long strip of sand located toward the northeastern coast of Koh Phi Phi Don. The area is a tropical cliché come true as, apart from a few classy resorts, it features only a small fisherman’s village and two or three standalone bars and restaurants. Outside the resorts, all activities are dedicated to the beach and sea: sunbathing, snorkelling or scuba diving on the reefs off the coast, exploring the charming Bamboo Island lying five kilometres off Laem Thong, and strolling south along the coastal path. The perfect place to spend a relaxing holiday, Laem Thong is definitely the destination for those looking for a break, but a trip to Loh Dalum takes roughly 40 minutes by long-tail boat, if you miss the hustle and bustle of a beach party! You like Laem Thong? Now pick the right hotel! Should I book my hotel in Long Beach? Long Beach is the eastern end of Tonsai Bay. It is only separated from the central area of Phi Phi Don Island by a rocky cape featuring a narrow jungle path which allows to get there on foot. The main assets of Long Beach are its tranquillity and its proximity with the village – a five-minute trip by long-tail boat - and all it has to offer in matter of dining, shopping, and nightlife entertainment. Long Beach hosts a few bungalow resorts and beach restaurants: it somehow could retain a bit of the Hippie-touch that the central area of Phi Phi has definitely lost. You like Long Beach? Now pick the right hotel! Should I book my hotel on Phi Phi East Coast? Remote and mostly only accessible by boat (it takes at least two hour to get there on foot from the central area of Phi Phi, trekking along steep jungle trails), the east coast of the island is the latest destination available in Koh Phi Phi Don. Since the beginning of the 21st Century, this four-kilometre-long wild coast has seen the construction of small bungalow resorts offering unpretentious accommodation choices to those who really want to get away from it all. Water sports – kayaking, snorkelling, and scuba diving – are the main activities on offer. Composed of narrow beaches, lying at the foot of mountains covered with thick vegetation, the southeastern coast of Phi Phi is the right place for nature lovers. The main spot here is Loh Bagao, a large bay that hosts stylish hotels, as well as a small village at which you can find bars and restaurants. You like Phi Phi East Coast? Now pick the right hotel!